Daguerre was born on November 18, 1789, in Cormeilles, France. His elementary schooling was disrupted by the French Revolution, as political upheaval caused a shortage of funds for public education. His talent for drawing became apparent at an early age; it led him to an apprenticeship with an architect at age 13, however, he was more interested in painting landscapes and portraits, and he moved to Paris in 1804 to become an artist. After studying under a stage designer, Daguerre began painting landscapes in 1807 but received no encouragement from art critics for his work. Turning to the theater, he obtained a design post at the Théatre Ambigu­ Comique, where his innovative use of color and light was admired. In 1822 Daguerre introduced the Diorama, a technique in which sets were painted on large translucent linen screens and light was shone through them to create illusions of depth and movement. The basic sketches for the Diorama were often made using a camera obscura, a box with a small lens at one end and a screen at the other, and Daguerre began investigating ways to capture and fix camera­obscura images to increase the efficiency of the work. Daguerre met French inventor Joseph Nicéphore Niépce, who was developing the science of photography, in 1826. They formed a partnership in 1830 and conducted experiments aimed at fixing an image on a surface treated with light­sensitive chemicals. Niépce died in 1833, but Daguerre continued his work with great success: using silver salts he found that mercury vapor could develop an image on a copper plate coated with silver iodide. Developing the image, dubbed a “daguerreotype,” took only 20 minutes, while Niépce’s process had taken eight hours and produced a fainter image. 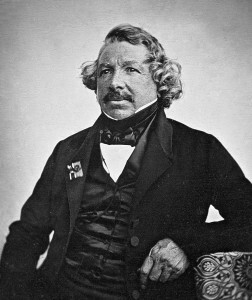 The French government gave Daguerre a lifetime pension in exchange for the rights to the invention; the daguerreotype was introduced to the public in 1839. Daguerre retired in 1840 and died on July 10, 1851, in Bry­sur­Marne, France. The technology behind Daguerre’s invention, soon called a “photograph,” was rapidly improved and formed the basis for the various applications of modern photography. Daguerre’s photographic process had several flaws. The equipment was bulky and exposure required 10 to 15 minutes in strong sunlight; the image was laterally reversed, and it could not be replicated. In 1840 exposure time was reduced by adding silver bromide to the silver iodide coating, and in 1841 it was further reduced by the addition of an improved camera lens. In the 1840s photography studios opened in Europe and North America. In 1841 the photographic negative was introduced by English inventor William Talbot. The negative, in which light and dark regions of the image were reversed, could be used to produce multiple copies of the original; it also solved the problem of lateral reversal. Negatives led to the first books illustrated with photographs. American chemist John Draper, a pioneer of scientific photography, produced a photograph of the moon in 1840. To illustrate a book on physiology published in 1850, he made the first microphotographs, photographs requiring a magnifying instrument for proper viewing. In 1851 English inventor Frederick Archer devised a photographic process involving collodion (a solution of nitrocellulose in ether) that was more sensitive than previous solutions and reduced exposure time to between two and 20 seconds. The photographic dry plate made its debut in 1871. While experimenting with photographic solutions, English chemist Joseph Swan found that heat increased their sensitivity. Even drying the solutions on the plates produced better images, and the resulting dry plates were easier to use. American inventor GEORGE EASTMAN made photography portable and popular with the introduction of flexible film and the small Kodak camera in 1888. Twentiethcentury technology advanced to include movies, color film, Polaroid “instant” prints, three ­dimensional holograms, and many sophisticated cameras and specialized film. Posted on March 5, 2015 by Natalie. This entry was posted in Photographers. Bookmark the permalink.